Samsung Galaxy A50, announced discreetly during this year's MWC is slowly heading to Europe. For now, the Lithuanian operator mentions it, giving the price and the start date of the sale. 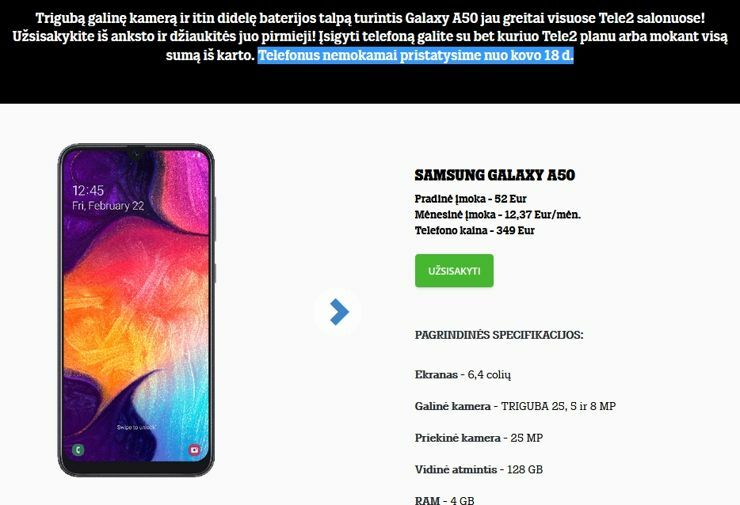 The Lithuanian Tele2 network already presents Samsunga Galaxy A50 on its website, offering it with 4+128 GB memory at a price of 349 euro. We can therefore assume, that the Polish price will also land in this area. Tele2 also offers a subscription and installment sale, for 52 euro for start and 12.37 euro per month. The first delivery dates were set for March 18. This may therefore be the date of the European launch. The Polish branch of Samsung is silent about Galaxy A50, we do not know the date of the second average announced at the MWC, Galaxy A30. Source Tele2; viewed: 262 times.